A Good Night Sleep can be your best friend !!! Dust Mites are microscopic cousins of the spider. You can’t see them, but they love to crawl around, nest, reproduce, and defecate in your bed. That’s because these creepy cousins thrive in a warm, dark, moist-environment – like mattresses and pillows that absorb moisture nightly from hours of breathing and perspiring – especially if there’s an abundance of human skin flakes (from normal shedding) to feed on. And they leave a trail of excretion that’s long been recognized as a leading cause of allergies and asthma!If you wake up some mornings with itchy eyes, sinus congestion, sneezing and other respiratory ailments, there’s a good chance you have uninvited guests in your bed. 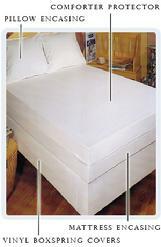 With Dust Mite barrier bedding, you’ll sleep better and wake up refreshed – without allergic symptoms, and without worrying about microscopic mites crawling around in bed with you.Our easy-to-apply cotton/poly mattress protectors, Duvet and pillow protectors are lined with a silent mite barrier between you and unwanted visitors – and come with a no-nonsense Life-Time replacement warrantee.